It was dusk when the Carnival arrived in town. A Carnival had never been here before, least not in the twenty-six years I’d been alive. But then it’s just a small hick town. No one comes here very often. I stood on the side street and watched as the train of oddly shaped wagons pulled into the empty green at the far end of Main Street. A fizz of excitement coursed through my veins and I hurried home to tell my mother the news. She said that her mother mentioned a Carnival that visited here many years ago, when she was a girl. “No, she said it frightened her. She said it stood there alone in the darkness, like it was waiting for something or someone.” My mother shivered and rubbed her arms. “Are you going to come to the Carnival?” I smiled trying to lighten the moment. I knew how she believed in, you know, ghosts, devils and the likes. “No, I’m too old for that sort of thing.” She carried the stew to the table and dished it out. We ate in silence, but my mind raced with this new attraction that had appeared. The next evening the music drifted through the air to reach into every corner of the town. I hurried towards the entrance that was lit by coloured lights, a rainbow glittering in the dark sky. A man in top hat and tails welcomed the crowd as we swarmed through the gates. The place was alive with music, lights and jostling people as I walked on taking in the sights. The strong man my grandmother had spoken of was there, inviting the crowd to feel his muscles. 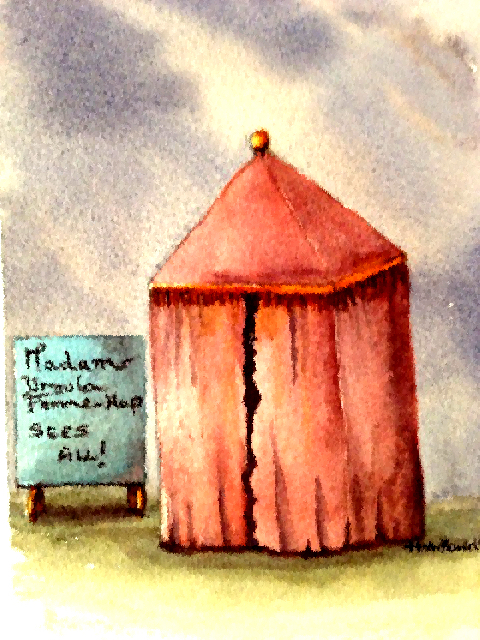 I walked around drinking in the atmosphere, and then I saw it, the tent with the words: ‘Madam Úrsula Femme-Hap sees all.’ It was nestled in the corner all by itself, as though it wasn’t really part of the Carnival but somehow, still belonged. It can’t be the same person. I thought. She would be over a hundred years old. My eyes remained fixed on that sign. But the urge to go inside was too hard to resist. It was like it was meant for me. I brushed aside the tent flap and entered. A wizened weather beaten old woman sat at a table where a single candle burned in its brass holder. She crooked a gnarled finger at me and beckoned me to sit down. I pulled the chair aside and slipped in. My eyes adjusted to the dimness and I could now see her face plainly. She never spoke a word. Her ink like eyes burned as bright as the candle flame and as I looked deeper into them, what I saw made my heart race. She took my hand into hers her skin was cold as death itself. I tugged my own hand free and stood up, knocking my chair to the floor with a thud. For a moment I froze as she continued to hold me with her piercing gaze, before I broke free and staggered out of the tent. Beads of sweat had formed on my brow and my legs felt as though they would collapse beneath me. I forced myself to walk away, taking one last glance over my shoulder. The tent was no longer there. I swung around and retraced my steps. But there was no sign of it or that it had ever been there. How can this be? At the entrance I asked the man in the top hat and tails about the tent and the woman. I thought about telling him I’d seen the tent, seen the woman, but knew he would think me crazy. So I just said that I’d heard some people mention her and was curious to know more. Then I left the Carnival and its lights behind me. It’s been one year since that Carnival visited. What I had seen in that old woman’s eyes was my own death. She showed me how I would be murdered. What she didn’t show me was when and where it would happen or by whose hand. There was something dark, cold and spiteful about her, that left me in no doubt that what she showed me would come true. Now, I live my life watching all those I come into contact with. I believe we make our own future and I plan to change mine, by killing the killer first. Now that's how you ride the tiger! oooo errr now I'm scared to comment in case I repeat myself from the last time! But then this is a tale about futures and pasts!